If you are anything like most Americans, you rely on your car to get you through your day. With most urban areas so spread out and ringed by suburbs, the common pattern for commuting to work is for a person to live in the suburbs and drive into the city in the morning and then leave the city in the evening and head back to the safety and lower priced comfort of the suburbs. Also, if you are like most Americans, you expect your car to work each time you turn the engine on and, when it does not, that presents a major problem. A car with engine, transmission or other trouble can lead to the inability to get to work, missed productivity and income, and even, in the most dire cases, the loss of a job. So, when you turn on your car, you expect all of its parts to run like clockwork. That includes parts you may never even have heard of, such as the camshaft sensor. So what in the world is a camshaft censor and what will happen to your car (and your pocketbook!) if it stops working? To describe a camshaft sensor, you must first know a little bit more about the camshaft itself. A camshaft is an auto part used in piston engines. It is used to operate valves called poppet valves. The camshaft looks like a cylindrical rod with a number of lobes (called “cams”) protruding from its length. Those little cams then rotate, and as they get to the poppet valves, they press on them, causing them to open. Sound like a lot of gibberish? Well, the way a camshaft and camshaft sensor works may sound complicated, but keep in mind that the camshaft is actually a historical invention. The first camshaft was invented in Mesopotamia (now Iraq) in around 1206 (or at least that’s when it appears in the historical record as described by the writer Al-Jazari.) The cam shaft appeared in Europe around the 14th century, and possibly even earlier! A car's camshaft is connected to the crankshaft. This is because it is vital that the car's poppet valves open and close at exactly the right time. This connection can be made through a gear mechanism or via a belt (i.e. the timing belt or the timing chain.) When you hear that one of your car's belts is in trouble, this could very well have to do with the camshaft or the camshaft sensor. Though this is not true now, back when fuel injector systems were in their infancy, the camshaft would be used to operate the fuel injectors. Camshaft sensors worked as a part of that mechanism, as well. 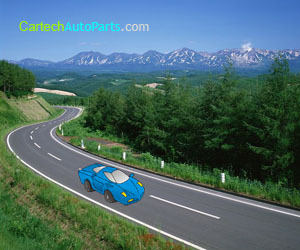 Sport car racers are also especially interested in camshafts and camshaft sensors. The camshaft can be advanced or modified in order to produce better low end torque. It can also be lessened, or retarded, to make better high end torque. This torque, a type of rotation, assists in high performance in vehicles. Here is an example of the way camshaft and thus, camshaft sensors, work. In a simple two-stroke engine, if it uses a camshaft, that is, each poppet valve opens once for each rotation. In two-stroke engines, the camshaft and the crankshaft (which it is connected to) rotate at the same rate. In a four-stroke engine, on the other hand, the poppet valves are opened only half as often as with the two-stroke engine. So, in a four-stroke engine, the crankshaft rotates two times for every one time the camshaft rotates. Now, when your car breaks down, perhaps you have a little more knowledge of camshafts and camshaft sensors. Why is Vauxhall/Opel so crap at making cars work? I purchased a lemon of a 1.4 Astra Club in September 2004. I'll never buy Vauxhall again! In the first two years the power seer failed with lose of oil, then the engine seals failed at 15,000 miles, now the bloody electronics at 17000 likely cause the can sensor! A positively crap car from new! Oh the horn never worked when driving but with engine off was fine! The bloody indicators don't stay on when turning and don't cancel when straight! What can I say about the car?....looks good but may as well be an old Skoda, Lada, Yugo!